Creating web site map with free templates and examples. Web site map has never been easier. A website map is used as a planning tool in web design to visualize the structure of a website. It allows the users to navigate through the site to find the information they are looking for. 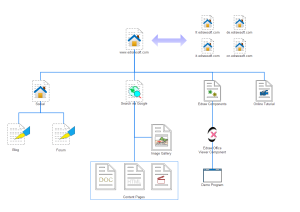 Edraw website map diagrams help you maintain and troubleshoot your site. 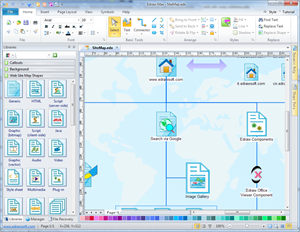 Edraw software enables you to draw site maps for web sites easily on HTTP servers, network servers, and local hard drives. Edraw provides many templates for you to analyze your site's organization and to classify its content. Moreover, website maps are particularly helpful when you inherit sites you're not familiar with. With Edraw, you can easily and quickly draw site maps for web sites on HTTP servers, network servers, and local hard drives. What we like about it is its simplicity. In Edraw's library, you can find all the symbols and shapes you need for website maps. You can simply drag and drop the shapes onto your drawing page, and the smart connectors will help you connect the symbols in a very easy way. You can design and customize your drawing with its rich color schemes and fill options. You can also use the pre-made themes with only a single click. Once you're finished, you can output the drawing to PDF or other graphic format. Edraw is absolutely the best drawing tool that fulfills your needs. 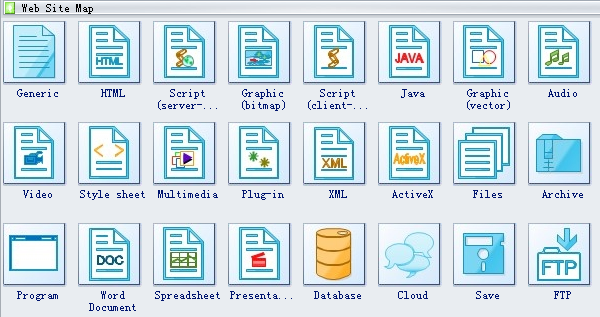 Edraw software offers you plenty of special shapes and symbols used in the web site map shapes, generic, HTML, script (server side), Graphic (bitmap), script (client-side), Java, graphic (vector), audio, video, style sheet, multimedia, plug-in, XML, etc. We have presented a pre-drawn website map template to save you from wasting time on little things and focus on key factors.